Let me take this opportunity to wish each of you and your dear family a happy and joyous Christmas. I would also like to wish you a healthy, peaceful and a successful New Year! 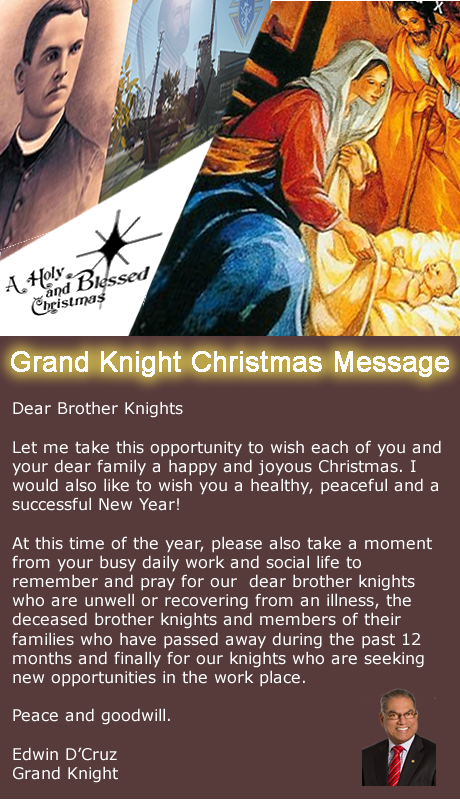 At this time of the year, please also take a moment from your busy daily work and social life to remember and pray for our deceased brother knights and members of their families who have passed away during the past 12 months and for our knights who are seeking new opportunities in the work place. On a separate note, what is of particular interest to you and what you would like to do by way of giving back to the community; please reach out to the Deputy GK Patrick Bajcar and/or me and let us know which particular area of the council you would like to be a participant and volunteer. We need to increase member participation in our monthly general meetings and my goal is to see the percentage increase by 20%. I believe we are on the right track in trying to achieve this mark and I am encouraged by your participation in the past few meetings of the new fraternal year and most importantly when we touched the 100 mark at the November 19 Fraternal Activity Night (FAN). Finally, thank you to the Executive Members and Directors for all your good work since assuming office in July. As we enter the New Year and second half of our Fraternal Year, I believe we are well positioned to make this yet another successful year for our council. Christmas is the most wonderful time of the year. However, in today’s world Christmas is commercialized and the day has been secularized. The question we ask is: Are we partly to blame for this commercialization and secularization? Haven’t we have supported it in some form or another? We have taken our children to the mall and have taken pictures with Santa. We have put gifts in the stocking and told our Children they were gifts from Santa. We have made Santa Claus more popular than Jesus. We have encouraged songs about Snow man, Santa Claus, Reindeer and what have you….We have inadvertently helped, those that don’t want Christ, to remove Him out of Christmas. But it’s never too late. If millions of Christians put their heart and mind to it, they can surely bring back Christ into Christmas. 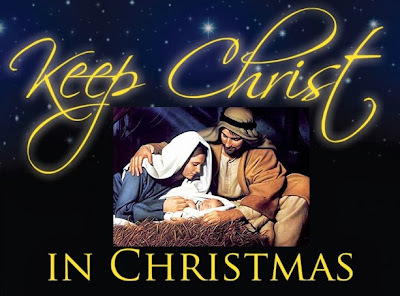 But what does keeping Christ in Christmas mean? The number one way to keep Jesus Christ in your Christmas celebrations is to have him present in your daily life and make Him the centre of your life. Keeping Christ in Christmas is more about the way you live your life than the things you say, such as "Merry Christmas" versus "Happy Holidays." Let us do things differently this year. There are simple ways to keep Christ the central focus of your life this Christmas season. Give God a special gift that is just from you. Let this gift be something personal that no one else needs to know about, and let it involve a sacrifice. Visit a sick relative, friend or an acquaintance that is homebound. Read the Bible, commit to pray with family and friends this advent season. Pray for Peace. Set up a Nativity scene in your home. It is a good reminder why we celebrate Christmas. Send Christmas cards that have Bible verses and artwork that remind the receiver about the arrival of Jesus and not Santa Claus. Write Christmas and not X-mas. It would be good if Christian Canadians bought religious postage stamps, although the tradition of sending Christmas card through mail is slowly dying. It supports a worthy initiative from Canada Post, one of the few official shows of Christianity when slowly but surely everything Christian is slowly being removed, and helps keeps Christ in Christmas. Listen to Christian music and carols sung by Christian artist. Shop at stores that keep Christ in Christmas. Look for gifts that support Christian charity. Volunteer to help the homeless. You can also plan a project of goodwill to a needy family. Find someone with a genuine need, involve your whole family and see how happy you can make someone this Christmas. And most importantly, we can lift our minds and hearts to Jesus in prayer. Here is a prayer you could say from your heart. Loving Father, help us remember the birth of Jesus that we may share in the song of the angels, the gladness of the shepherds, and worship of the wise men. Close the door of hate and open the door of love all over the world. Let kindness come with every gift and good desires with every greeting. Deliver us from evil by the blessing which Christ brings, and teach us to be merry with clear hearts. May the Christmas morning make us happy to be Thy Children, and Christmas evening bring us to our beds with grateful thoughts, forgiving and forgiven, for Jesus’ sake. Amen. St. Francis Xavier Council 12067 donated $1,200 from the proceeds of their 12th Annual Golfing Tournament to the Silent Children’s Mission charity. The council has been supporting this charity for over 7 years during which time they have donated over $6,000. 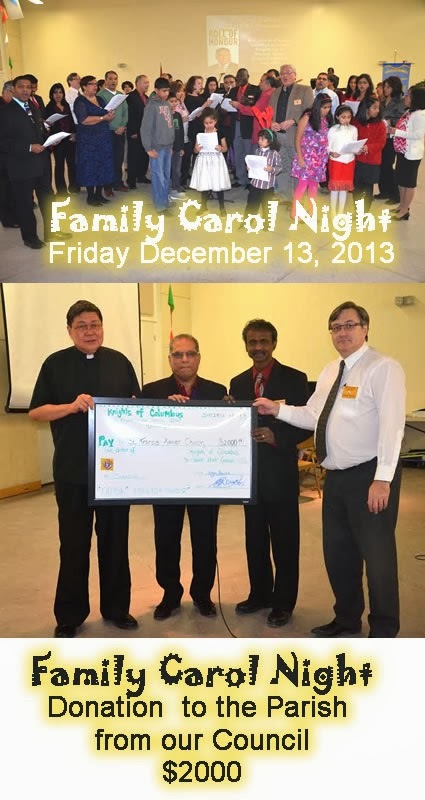 On Tuesday, November 19th the council held it first Fraternal Activity Night (FAN) in honour of our late CGK Mathew Rodrigues, for the current fraternal year 2013-14. The evening was preceded by a short general meeting to pass two important motions, one for making a donation of $2,000 to the St. Francis Xavier Church and the second $1,000 to the Typhoon Haiyan Fund, to support the devastation in the Philippines. Both motions were passed unanimously by the brothers. 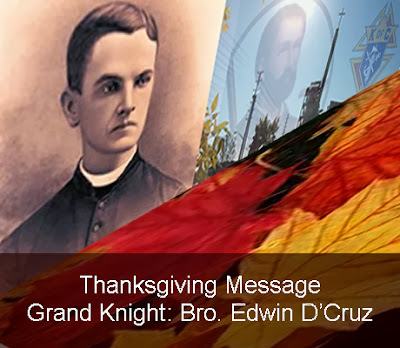 The Fraternal Activity Night was attended by 100 brothers, 4 candidates who were interviewed recently, Chaplain Msgr.Edgardo Pan, District Deputy Joseph Zielinski, Maureen Rodrigues, spouse of late CGK Mathew Rodrigues and Frankie Burg-Feret, Executive Director, Silent Children’s Mission. The Chair and MC for the evening was Bro. William Fernandes and he was ably supported by a team of hard working knights, who assisted all evening and prior to the event-thank you to all the knights who helped make this FAN night a big success. As well thank you brother knights for making the time to spend the evening with a fraternal activity, as without your presence and support the evening would not have been a successful one. The catering for the evening was undertaken by Konkan Delite which is owned by Bro. Loy D’Souza who is a member of our council. Our next FAN night is scheduled for Friday, January 24th @ 7 p.m. at the Parish Hall and the Chair for this event is PGK Valens Almeida. This FAN evening will be different in that we will give the brother knights who have their own businesses the opportunity to speak in brief and to showcase their business coupled with games. More to come from the Chair so stay tuned. 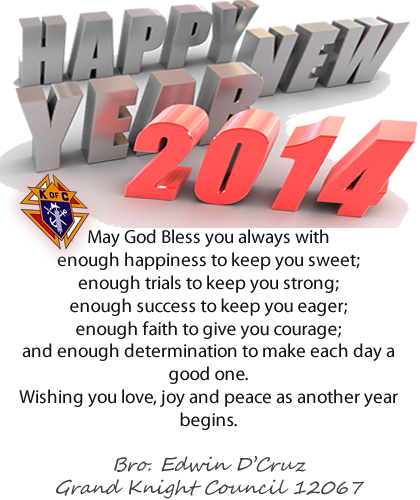 This is an email to remind of the various council activities for the months of December, 2013 and January, 2014. In this manner, you can plan your dairy accordingly, and decide which events you are able to attend and/or support and pencil it in to your diaries. 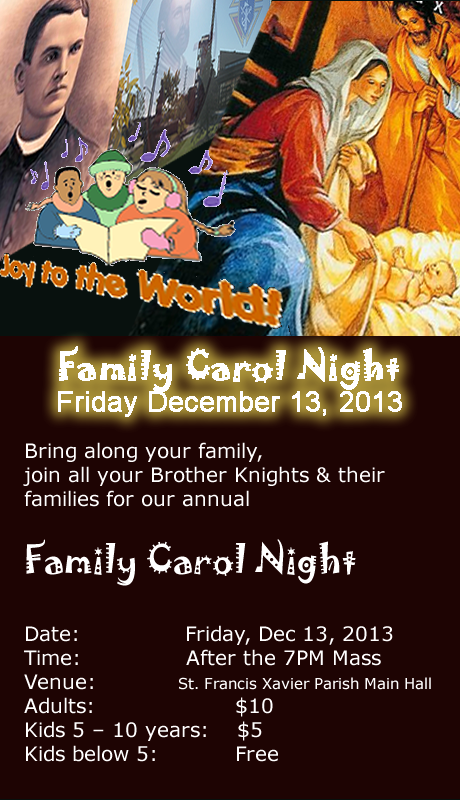 Parish Feast-St. Francis Xavier on December 3 Mass and procession at 7 p.m.
Executive and General Meeting on December 10, 2013 @ 7.30 p.m. Please not that this will be last meeting of the council for the current year. First Degree Exemplification on Sunday, December 22 @ 5 p.m.
Camel Heights Seniors’ Bingo evening on Wednesday 30 January, 2104 @ 7 p.m.
Further to my email communication sent to you earlier this evening, this is to formally inform you that at the executive meeting held on Tuesday, November 12, it was decided that the council should donate a sum of $1,000 towards the Typhoon Haiyan Fund to support the disaster in the Philippines. The State Deputy has also informed us today that donations made through the Supreme website will be eligible to be matched. Thus our proposed $1,000 will be doubled by passing the donation via Supreme and/or ShareLife. Notice is hereby given to you that a formal motion will be made on Tuesday, November 19 to donate $1,000 to the Typhoon Haiyan Fund via the Supreme website. The motion, as is the practice, will need to be seconded by a knight and subsequently voted upon and approved or declined by the members of the council. 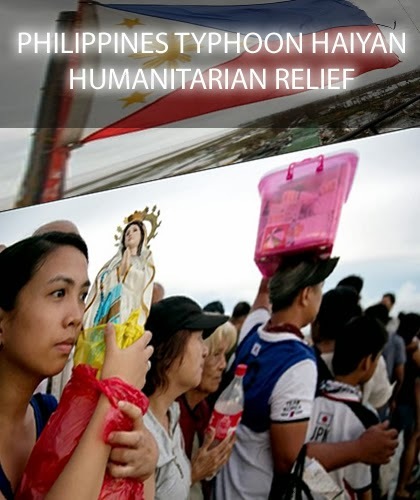 We are all aware of Typhoon Haiyan wreaking havoc in the Philippines and Kevin Daudlin, State Deputy has asked that his letter be circulated to all knights to inform you of Supreme and State actions which have been taken and how you can assist, or donate generously to the affected people in the Philippines. The council is also making arrangements to donate to the Typhoon Haiyan Fund and in this regards I will be sending out a notice of motion via an email due to the urgent nature of the donation to be made. We today concluded our first membership drive for the new fraternal year in a very satisfactory manner. The Brother Knights supported the membership drive by staying after mass and canvassing for new candidates. In addition, the weekend drive was well attended by knights along with their families who attended various masses. Thank you brothers! 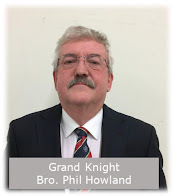 We had a Knight speaking after each mass from a prepared script and on behalf of the Membership Director and Fraternal Benefits Advisor Brother Alan Pires, please accept our grateful thanks for volunteering to do so and doing a great job of it. Thank you also to the IPGK and the PGK’s who provided their full support with their presence and canvassed for candidates along with the brother knights. Thank you PGK’s! Our thanks also to Joanita Miranda for her assistance in coordinating the membership drive event. Last but not least, thank you to our Pastor Msgr. Edgardo Pan, Associate Pastors Fr. Susairaj Savarimuthu and Fr. Joshua Roldan, for their valued support at all the masses and for pitching for the knights. 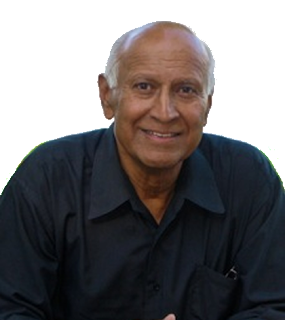 This is a gentle reminder concerning our forthcoming .General Meeting coupled with a Free Fraternal Activity Night scheduled for Tuesday, November 19th commencing from 7 p.m.
With the passing of our Charter Grand Knight Brother Mathew Rodrigues, the fraternal night for will be held in his memory and to honour him. We will be praying the Rosary at 7 p.m. followed by the meeting which will be very short (15 mins or so) and then commence with the fraternal activity night. As informed earlier, food will be served, courtesy of our Council, and for this purpose we will need brother Knights who will be attending the event to let us know if they will be attending well in advance of the payment. The event is being spearheaded by Brother William Fernandes and his Committee of Brother Knights. You will be contacted by the committee members by way of the calling tree. However, if you receive this email, please be kind enough to respond to me with an aye or a nye. For those brother Knights from our Council who have a business or work for a business where they would like to promote themselves, you are welcome to participate in this event. We are planning to have tables placed around the parish hall where you could place your advertising material or banner, etc. However, prior to doing so you must clearly let the GK know about it in writing, well in advance of the event. The council will be praying the rosary on Thursday, October 24th @ 7.30 p.m. sharp at the visitation centre. Kindly come dressed in your blazers and name badges. Please find below a self-explanatory email received from the Worthy IPGK Joseph Remedios. I would kindly request your support and mark of utmost respect by participating in the First Degree Exemplification that is to take place at our parish hall on Sunday, October 27 @ 5.30 p.m.
Greetings on this Sunday afternoon, I am sure all of you have received the news of the passing away of our Worthy Past Charter Grand Knight Brother Mathew Rodrigues, As a token of appreciation for his support and commitment to our Council we shall dedicate this Degree on Sunday in his memory, Kindly request the brothers knights from the Council to come and be part of this Exemplification. Worthy Grand Knight Brother Edwin, can you kindly send out an email to the membership for participation. I take this opportunity of wishing each of and your dear families a very Happy Thanksgiving safe long weekend. I also take this opportunity to thank the brother knights who volunteer on various council related projects and for the many hours that you put in by joining the committees as chairs and members and for sharing your good ideas and hardwork with the council; my grateful thanks. For those brother knights that are going through difficult times (health, job related and other associated matters), our prayers and thoughts are with the each of you and your dear families. Last but not least, to my Executive and Directors Team, thank you for your support dedication to the council and to me, since taking over as the GK in July of this year. I am pleased to inform you that we successfully conducted the Life Chain event this afternoon under the able guidance of Brother Hilario Li, Pro-Life Director of our Council. 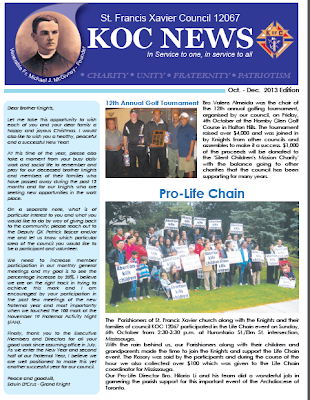 Thank you to all our parishioners, brother knights and their families who made the time to attend the Life Chain Event. I am penning this email to let you know (if you were not able to attend) that our council’s 16th Annual Anniversary Dinner & Dance held on Saturday, October 5th at the St. Francis Xavier Parish Hall, was well attended (over 225 attendees), entertaining the crowd with live music & DJ by the Marawders band, Emceeing by the affable Melroy Borges and catering by Konkan Delite, who is also a knight from our council. The evening was graced by a number of dignitaries including the Parish Pastor Rev. Msgr. Pan, Associate Pastor Rev. Fr. Susairaj, District Deputy Joseph Zielinski, St. Andre Bessette Assembly (FN SK Graham Nickalls, councils [Christo Rei (GK Vally D’Souza) Credit Valley (GK Andrei Dias), Mount Carmel (GK James Lobo) & St. Josephine Bakhita (FS Serge Poirier)], PGK’s (CGK Mathew Rodrigues, Anthony D’Souza, Fred Gamboa & Gabriel Ogundele) from our council, the CWL (current and past presidents) and PDD’s/PGK’s from other councils. For those brother knights that attended the anniversary dance with their spouses, thank you for your support. The Committee Members & the Executive Team would like to thank our sponsors, advertisers and those parishioners and knights that donated gifts to the council to make the evening a successful one and thus helping us achieve our goals and objectives for this high profile council event. You will be pleased to know that we raised over $4000 (budget exceeded by 100 percent). Brother Savio, Chair for the event and his fully energised and hard working committee, did an excellent job in ensuring that the knights and our guests enjoyed the evening. Thank you Chair and Committee Members for your volunteer work and making sure that everything turned out well. Our 17th Anniversary Dinner & Dance date is Saturday, October 18th 2014. We finally concluded our golfing event yesterday afternoon and had a great finish to it, albeit with a smaller group of ardent golfers and enthusiasts. Our Chair for this event, Brother Valens Almeida with his tenacity and never give up attitude, along with the support of his golfing committee, saw us through the finish line comfortably. Despite all the challenges that this committee has faced weather wise, I am pleased to inform you that our budget target for this fund raising event coupled with fraternal activity, has met its goals and objectives. More details of the net funds raised will be made known to you in the next few weeks. For those brother knights who joined us from our council and other supporting councils, a "BIG THANK YOU" to each of you. Once again, on behalf of the Executive Team, our thanks to the Chair Brother Valens Almeida and his Committee Members for a job well done.